Never heard of the television series Black Mirror? You should. Many reviewers are quick to praise this bold new television anthology as a modern-day Twilight Zone but the series is more like a modern-day Outer Limits. 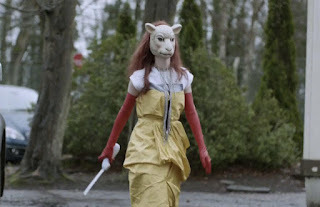 Each episode contains a completely different story, with different cast, centred around dark and satirical themes that examine modern society, particularly with regard to the unanticipated consequences of new technologies. 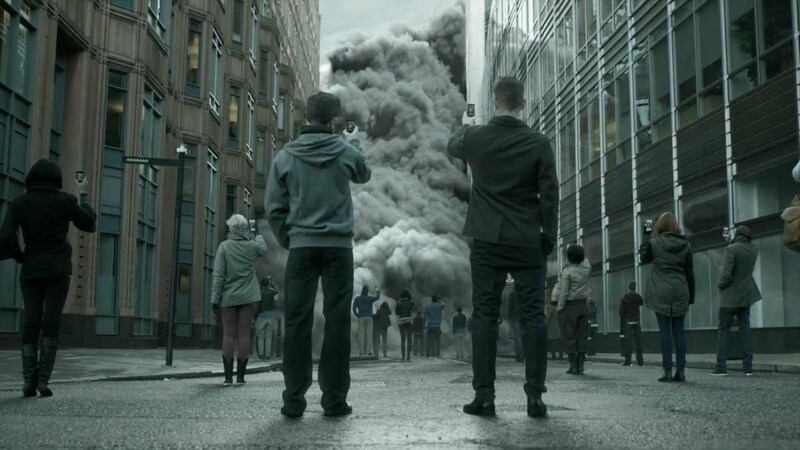 As executive producer Charlie Brooker best describes it, "They're all about the way we live now – and the way we might be living in 10 minutes' time if we're clumsy." Jon Hamm in the superbly-scripted Christmas episode. In the episode "Men Against Fire," a U.S. Army militant named Stripe accepts a neural implant that helps him identify and sweep out "roaches" -- people who are contaminated and have physically become mutants. During a routine mission, an experimental device sends a shockwave through his brain and he quickly discovers that the "roaches" he and his men have been hunting down are ordinary people. The U.S. Government, in an effort to purge the world of people with genetic differentiation (higher rates of cancer, muscular dystrophy, etc. ), brainwashed their soldiers into believing otherwise. Or was the shockwave device manipulating him to into believing "roaches" don't exist when, in fact, they do? The solution to the mystery is revealed at the conclusion but the episode explores something deeper in the end: who specifically has this power of choice? Three episodes were initially produced in early 2011 and telecast in late 2011 over Channel 4 in England. 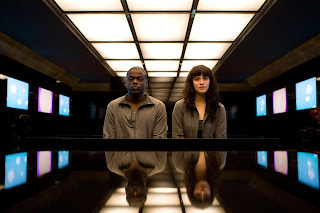 Having received high ratings and rave reviews from critics, Black Mirror went into production for an additional three episodes, produced in late 2012 for a second season, followed by an extra-length Christmas special telecast in December 2014. Soon after, Netflix picked up the series with six additional episodes for a third season. All 13 episodes are now available for streaming on Netflix. Two time travelers are best of friends in "San Junipero." 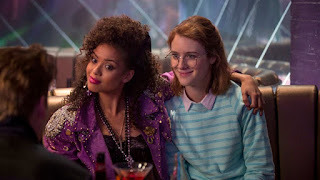 My personal favorite is "San Junipero," concerning two female time travelers who meet up in the California-like San Junipero, in 1987. The vibrant nightlife of the locale adds to the attraction and mystery regarding who exactly these women are, where they come from and how they manage to travel through time. Listen carefully as they make verbal references that are almost oblivious and remain unexplained until the final moments. There is a kink in their armor and their existence is threatened not by technology -- but by Mother Nature. The resolution not only exemplifies the best of human nature but is also storytelling at its best. This episode deserves a Hugo Award for "Best Science Fiction of the Year" and it better darn receive a nomination. A new video game using virtual reality in "Play Test." Black Mirror may not be generating the "buzz" like Stranger Things and Daredevil, but the program now has a loyal fanbase and has attracted the attention of the Hollywood elite. Bryce Dallas Howard stars in the episode "Nosedive." Hayley Atwell plays the lead in an episode where a woman revives her dead boyfriend by using his social-media history to rebuild his personality inside a synthetic clone. Robert Downey Jr. optioned the episode, "The Entire History of You," for a potential big screen movie adaptation. Jodie Foster is presently directing Rosemarie Dewitt for a fourth season episode, set to debut later this calendar year. Interesting, it has been reported that Netflix is taking a financial loss every year with their streaming programs, no doubt as a result of the expensive production costs of original programming. It seems the $9.99 monthly subscription for unlimited streaming is not cost effective. But to remain competitive in a growing landscape of streaming services, Netflix cannot afford to raise their subscription price. 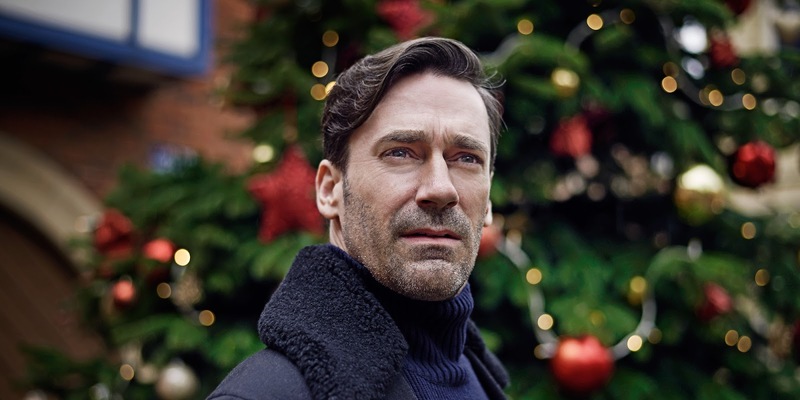 With such delights as Daredevil, Stranger Things and Black Mirror, programs the are more enjoyable than what the major networks provide, streaming subscribers like myself have a difficult time finding an excuse to unsubscribe. 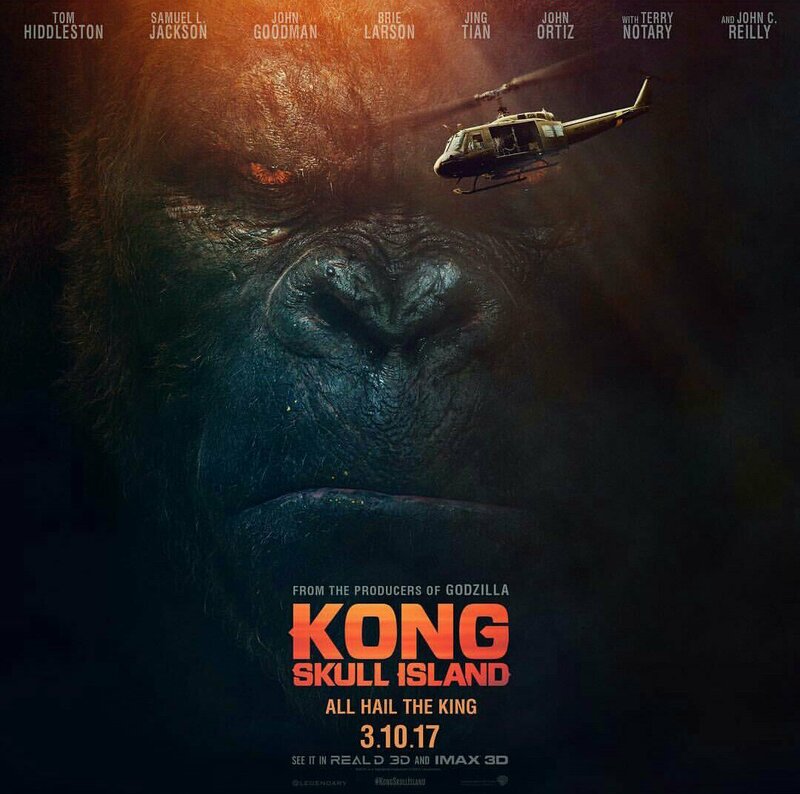 For those with a fondness of monster movies, especially films from of the 1930s through the 1950s, Kong: Skull Island is a loving tribute to a bygone era. 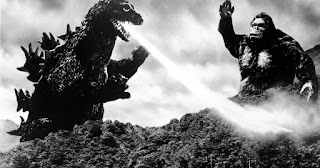 For a younger generation that has never watched a Godzilla or King Kong movie, we turn to DVD to be exposed to the classics that we all agree they don't make movies like those anymore... or at least, I used to think so. 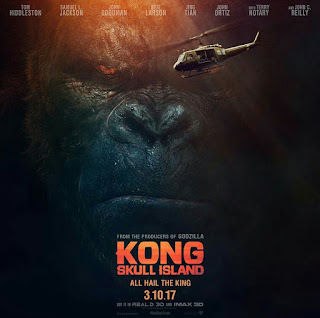 Kong: Skull Island should not be classified as a horror movie, but rather a monster movie... which will be a delight to a fan base best described by Ron Adams of Monster Bash as a generation of "monster kids." The King Kong franchise was launched in 1933 by RKO, followed by a sequel, Son of Kong, later that year. Over the decades the giant ape inspired multiple remakes, sequels and spin-offs (such as King Kong vs. Godzilla, pictured on the right). A period piece to be sure, the depression-era world of New York City suffers from the effects of a giant monkey running across the rooftops and climbing the Empire State Building, in an effort to catch his bearings in a man-made jungle. The original is still fun after all these years and this is why my wife and I rushed out to the theaters to watch was was obviously a reboot. Produced by the same folks who brought us the cool Godzilla film a few years back, I suspected we were in for a treat. What I was curious was whether a younger generation with a distaste for black and white could find a story about a giant monkey as much fun as we recall in our youth? This rendition, Kong: Skull Island blends the best of both worlds, providing the retro feel of 1973 Vietnam with a classic story of beauty and the beast. Giant spider? Check. Giant lizards? Check. Isolation on an island dominated by creatures that are practically prehistoric? Check. And of course, there is Kong, the eighth wonder of the world. When a group of scientists employ the U.S. Government to guide them onto an island discovered for the first time through satellite surveillance, they discover the hard way that man is not the dominant species on the planet. A battle for survival is evident but there is a backstory that provides (no spoilers here) a reason why Kong is king... and Kong has heart. Thanks to Industrial Light & Magic, the special effects are top-notch. The cast, including Brie Larson, Samuel L. Jackson and Tom Hiddleston, are perfectly cast. Sure, there are moments where they pay homage to Apocalypse Now and prior Kong movies, but there was something more important during a recent screening of the film: everyone involved with the production shared a love of classic monster movies. During the film's final action sequences I found myself doing something I have rarely done when viewing a modern-day movie. I was practically leaning in the chair and routing for one of the monsters... just as I did in my youth when I first watched those retro monster battles on local PBS. Being released in March, Kong: Skull Island will not win much along the way of awards but this is a popcorn movie that takes every monster kid back to an era when going to the movies and routing for your favorite monster during hand-to-hand combat was fun. After all, isn't that why we go to the movies? If you are sitting on the fence about going to see this movie, go see it. And you absolutely need to wait through the entire closing credits for a teaser that will not disappoint. It's worth waiting for. What is a Clipping File? Newspaper clippings and magazine articles are one of many sources historians, scholars and authors rely on for digging into our pop culture past. Often times this involves spending hundreds of hours in archives across the country. 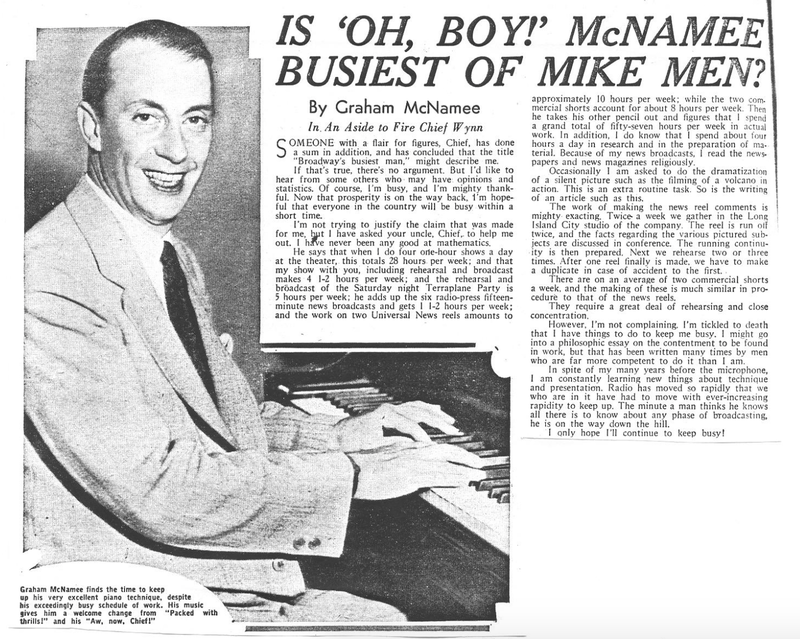 One short cut at our disposal are "clipping files," compilations of newspaper clippings and magazine articles highlighting the work of musical groups, actors, actresses, directors and other performing artists. Numerous libraries across the country have clipping files available for researchers. For the historian, clarifying which articles are fluff pieces scripted by a publicity department and which ones have meat and potatoes pose just one of many challenges. But the fact that a clipping file could contain hundreds of vintage articles on a particular subject, gathered in one location, makes such a research trip necessary. A clipping file is exactly what you think it is. Manilla envelopes and file folders containing anywhere from a few newspaper clippings to hundreds of magazine articles. They could be zeroed copies of old articles or the actual clippings, aged and yellowed. A clipping file on Frank Sinatra, for example, could include dozens of magazine articles about his radio appearances, marriages, movie reviews, and so on. Before the days of the Internet researchers had to travel out of state to such institutions as the Billy Rose Theater Collection in Lincoln Center in New York City, to browse such clipping files. Flipping through a card catalog listing names of stage plays, motion-pictures, radio and television programs, actors, actresses, directors and playwrights, all one had to do was find the catalog number and request a librarian to pull the files from storage. With a few dollars you could have the contents copied on a photocopier. I remember going through a clipping file on Duffy's Tavern, the radio program, and coming cross a clipping from a New York City newspaper reviewing a stage play with the radio cast reprising their roles. Up to that time a stage play based on the radio program was news to me and this provided enough leads for me to dig further elsewhere. Funny story: I remember paying a visit to a library once and a friend was sitting across from me at the table, reading each and every clipping, trying to determine if there was any value to having it photocopied. By the time he got to the third clipping I grabbed the file, shut it closed and handed it to him. "Go copy everything," I told him. Budget be damned. By the end of the day we had a stack of photocopies the size of two telephone books. I could take the copies home and review them on my own time. For $40 in copy fees we saved three days of reading and reviewing, and $40 was far cheaper than two additional nights in a hotel room. Thanks to the Internet libraries are now giving serious consideration to scanning the contents of their clipping files and posting PDFs on their websites. This would save researchers considerable expense because the costs involved are many: gas, tolls, hotel and food expenses. Libraries have been slow, however, because red tape is preventing the digitization process from going public. As it was explained to me, one library is concerned about copyright violations. Should a researcher make use of the information in a clipping file online without proper attribution, could the newspaper or magazine that retains copyright of the article file a lawsuit against the library? Another library hesitates posting clipping files on the Internet because they fear it gives patrons another reason why they should not visit the brick and mortar building. Why stay operational if no one is walking through the front doors? A third librarian explained their concern is online piracy. Who is to stop someone from downloading the PDF files and posting them on their own web page rather than provide a link to the library's website? I know of at least a dozen libraries that have clipping files. To date, a researcher still has to travel to those libraries to browse the files (or pay someone in the local area to visit the library and copy the contents of the files). On the plus side, two archives of clipping files are housed with private collectors/historians and not state and county-funded institutions. Sadly, one of these collectors passed away last year and bestowed his mammoth collection to me. I made two trips to his widow's house (five hours travel each direction) to fetch the collection. Systematically -- and with slow progression -- I am having all of these clipping files scanned into PDF files. And to ensure they are preserved, the files are backed up on an external hard drive and a dropbox account. By the end of this calendar year the entire collection should be scanned into PDF files by subject matter (Jack Benny, Bob Hope, Musical Steelmakers, Sky King, etc.) including my own personal collection of clipping files and those of another old-time radio historian who recently "cleaned house." This blog entry was designed for two purposes: anyone researching vintage movies, stage plays, radio or television programs may want to consider searching clipping files for additional leads. (I know of authors/historians who did not know what a clipping file was until I told them.) Second, while the scanning process at libraries has yet to commence, legal red tape starting to be regarded as a minor deterrent so we may have something cool to look forward to in the future. In the meantime, here are links for two clipping files for your amusement. Two weeks ago the Motion Picture Academy presented the 89th annual Academy Awards and for a few minutes, on national television, they honored four individuals by bestowing them with Honorary Awards for their lifetime achievements. The awards were given out during an awards dinner on November 12 but the acknowledgment on national television during the Oscars was traditional. Present in the audience to be acknowledged were the award winners: actor Jackie Chan, film editor Anne V. Coates, documentary filmmaker Frederick Wiseman and casting director Lynn Stalmaster. The latter of whom made history. Lynn Stalmaster, a native of Omaha, Nebraska, went to Hollywood in 1950 to seek out a career as an actor. He played all-too-brief roles in two movies, The Steel Helmet and Flying Leathernecks, while attending UCLA, then pursued a career as a production assistant at Gross-Krasne. When the studio system restructured as a result of the growing television industry, Stalmaster, along with his wife Marion Dougherty, opened their own casting office. Stalmaster is credited for the careers of Richard Dreyfus, John Travolta, Christopher Reeve, Jill Clayburgh, Jeff Bridges, Scott Wilson and Jon Voight, among others. He was responsible for casting such films as In the Heat of the Night, Tootsie, The Graduate, Inherit the Wind, Pork Chop Hill, Deliverance, The Right Stuff and many others. Casting directors, believe it or not, is the only position in Hollywood that appears during the opening credits of motion-pictures and has yet to receive acknowledgement by the Academy with an Oscar category of its own. So for Lynn Stalmaster this award meant something more. As a fan of television’s Have Gun- Will Travel I found it amusing that, among Stalmaster’s achievements featured in a brief montage on the screen during the Oscar ceremony, was the television Western by name. Amusing when you consider the fact that the Motion Picture Academy honors motion-pictures, not television. 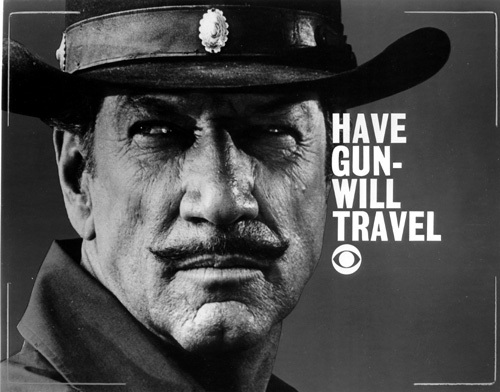 So for fans of a television Western that premiered almost sixty years ago and never conceived of the notion that it would – even for a brief glimpse – be acknowledged during the annual Oscar awards… well, it happened!